Rich, full-flavoured and caffeine-free, this specialty blend is a cleansing coffee substitute. The roasted wattleseed makes it a little nutty, while the cinnamon adds a spicy sweetness. 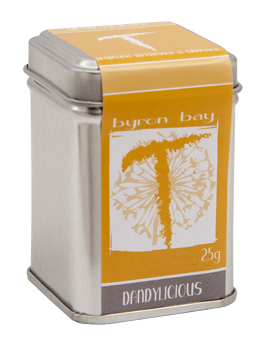 Ideal for ‘Soy Dandelion Lattés’ (LSDs) plus perfectly palatable on its own. As I sit here with the cup in front of me, I can smell the aroma from the cup – and it really does have a very coffee-like scent. When I bring the cup up to my nose for closer olfactory “inspection” the fragrance of the cinnamon becomes more distinguishable, but there is still a very coffee-like essence to it. The flavor is a little … different. It isn’t bad, but it is rather unusual, and I can see how the flavor might be a bit off-putting to some. This blend’s saving grace is the cinnamon, which adds a very pleasing spicy sweetness. I don’t think I’ve ever tried a dandelion tea before, or if I have, I wasn’t aware of it. So I don’t really know what that tastes like. I mean, when I was a kid, I used to munch on dandelion stems, and I occasionally enjoy a spring mix salad that has dandelion greens in it, but that pretty much sums up my culinary experience with dandelion. And then there is the wattleseed. I’ve only tried one other tea blend with Wattleseed in it (at least only one other to my knowledge!) and it was Byron Bay’s Chai. My lack of experience with two-thirds of these ingredients is quite apparent; however, I will do my best to review the teas based upon what I taste. I taste cinnamon (as I mentioned previously) – its sweet and warm spice tones are very apparent in this cup. There is a herbaceous kind of background note that is somewhat bitter and reminds me a bit of cooked dark leafy greens, so I am going to go out on a limb here and guess that this flavor comes from the dandelion. As odd as this bitterness is, I am finding it quite interesting and a delicious addition to the cup. There is also a pleasing malty flavor. I can also taste a nutty flavor to the cup. All of these interesting notes lend themselves well to the coffee-like translation of this tisane. I really liked this herbal tea. It is quite different from any other tea or tisane that I’ve tried thus far, and this uniqueness alone sets it apart and makes it rather enjoyable.